The FC-500 features a 4.3 inch display designed for viewing in direct sunlight. The display uses a one-touch interface that is optically bonded to increase visibility. The glass is scratch resistant. With a single key touch, the user can change the orientation of the screen from “portrait” to “landscape” to increase visibility when viewing maps or drawings. The Windows Mobile 6.5. operating system provides a modern operating environment and added expandability with other application software. 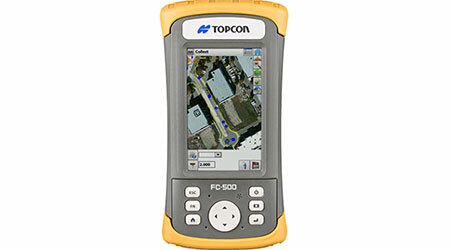 The 1GHz processor drives any of the Topcon field application software with ease. A 5 MP camera with auto focus comes with LED flash as standard equipment. That is why we built-in 8Gb of flash storage. Store hundreds of photos, and if you fill the memory, transfer data easily to any computer or USB stick. The System has Geotagging that will embed and emboss photos with the time, date and the GPS position. The optional internal cellular modem is a global device capable of data communication with Topcon’s MAGNET products to send and receive data to the MAGNET “cloud,” making it easy to communicate with field crews when projects need to be changed or if important data is required back in the office. The GPS option provides a navigational functionality that is capable of accuracies in the 2-5 meter range. The receiver is a 32channel, allinview tracking up to 1Hz. This internal GPS can be used for navigation or general positioning. This GPS position can be used with MAGNET software to place your position displayed on Bing™ Maps overlay. Bluetooth and WiFi come standard, with no need for expensive upgrades.. Also standard is a way to turn them off to conserve battery power when the services are not needed.. With Topcon’s other advanced systems coming to market with built-in WiFi, this form of data exchange will become more and more important. Use your device in any “hotspot” location to surf the web, check weather, e-mail, send to and receive files from the office, etc.